AoTNYC – 3/21 Blast Off! Join Astro on Tap NYC on March 21 – 3/21 – for our 3..2..1.. BLAST OFF! event. We’ll be exploring rockets and living in space. 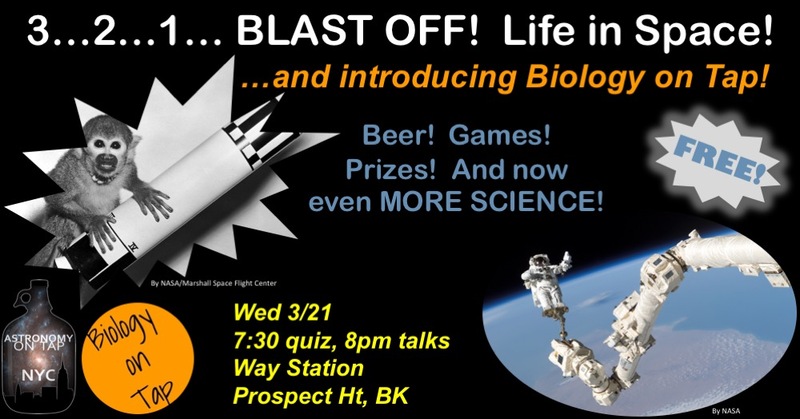 And joining us will be the debut of NYC Biology on Tap NYC! FREE!! More details and RSVP on our Facebook event page. We’ll see you at the Way Station in Prospect Hts, Brooklyn. Trivia starts at 7:30pm, talks at 8pm, prizes at 10pm.